Click the picture or links below to download this slideshow example. This presentation example is gorgeous for the highly artistic blend of color, shape and ideas. Applying graphic organizers to enhance learning is quite effective. These slides will surely help you deliver wow and help more people learn better. See more details about how to Apply Graphic Organizers for Better Teaching and Learning. 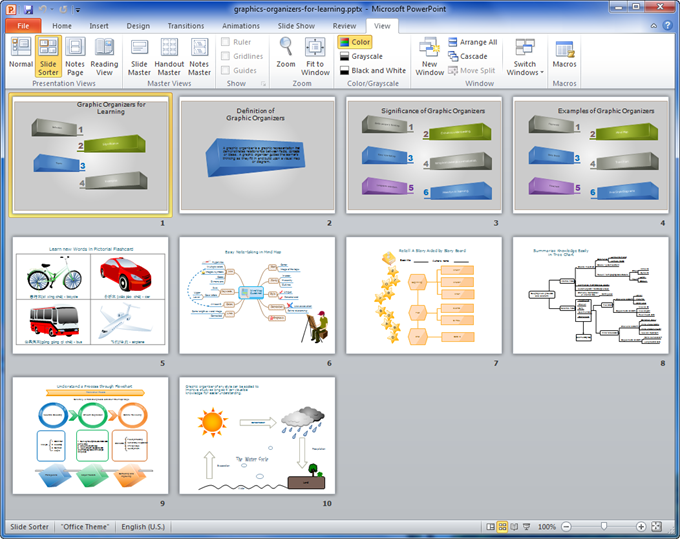 To draw diagrams like those shown in the presentation, try our amazingly powerful diagramming software. If you have installed Edraw, download the eddx format presentation. And then you can gain myriads of resources to enrich the presentation, including 8500+ vector shapes and 1000+ diagram templates.